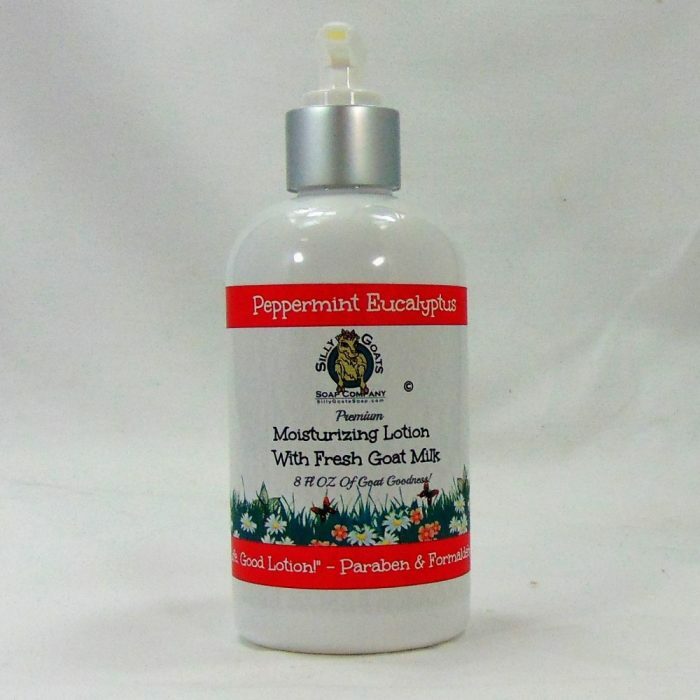 Peppermint Eucalyptus Goat Milk Lotion! 100% Natural. Great News – We have changed our 8 ounce bottle to a new pump bottle, making it easier to dispense. We are also happy to announce a new 16 ounce pump bottle, for those of you asking for a larger size! After to much peer pressure, we have made the Peppermint Eucalyptus Lotion! 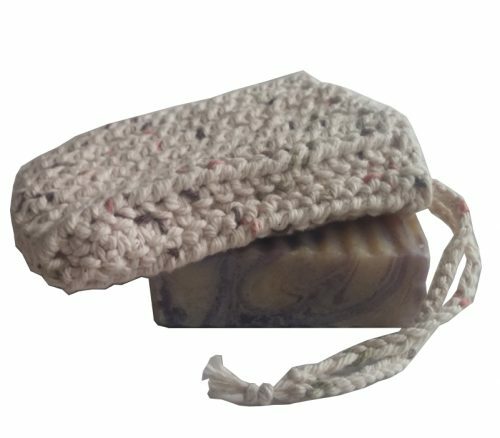 We have had the Peppermint Eucalyptus soap for awhile now and people love it and we have been getting asked at every show to make the lotions with those essential oils, so we did! 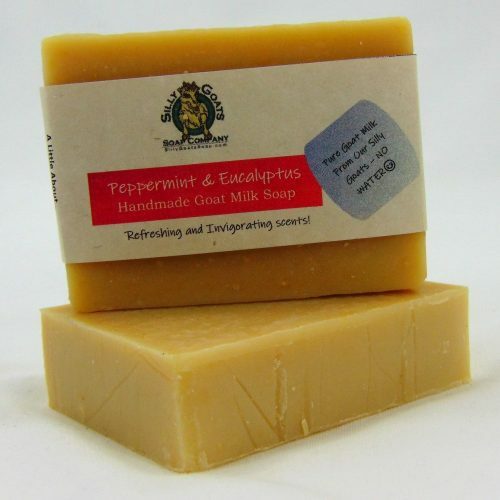 Nice pepperminty fragrance with the under tones of menthol from the eucalyptus. very soothing and calming qualities to this lotion. I should have named it Serenity. 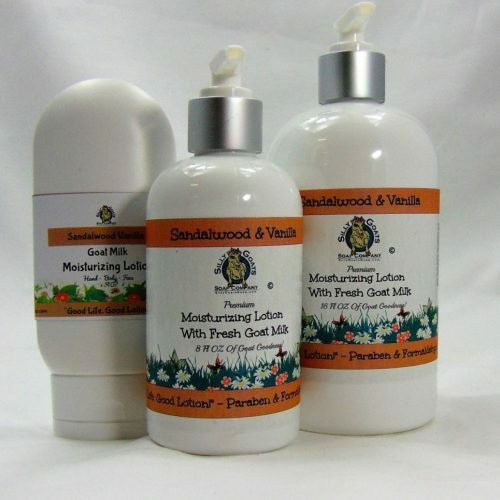 All our goat milk lotions contain the finest natural oils and of course, fresh goat’s milk! We begin with Sweet Almond Oil penetrates down-deep into the skin to help restore elasticity. Almond oil smooths out wrinkles, tones, and conditions the skin. Sweet almond oil has proven successful in the treatment of various skin ailments including eczema, psoriasis, dermatitis and rosacea. Avocado Oil. This oil regenerates cells, softens body tissue and heals dry, scaly skin. You not only get a moisturizing component, but a healing one, as well! Avocado oil is also known to be good for sensitive skin. Last but not least! Shea Butter, is mild enough for babies and awesome enough for sensitive skin. This lovely butter soothes and softens dry chapped skin, and every skin type. We can’t forget the goat milk either! 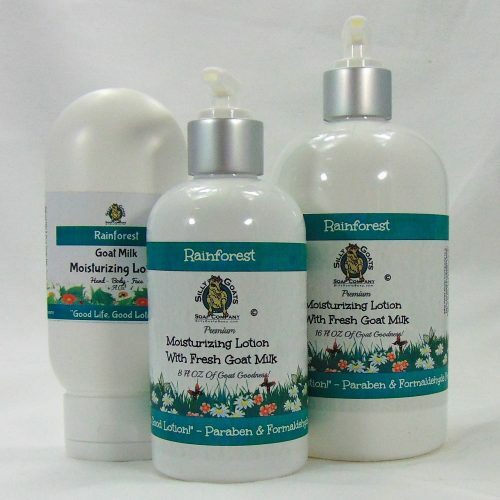 Fresh Goat’s Milk, contains a high percentage of natural ingredients which act as a natural moisturizer for the skin. 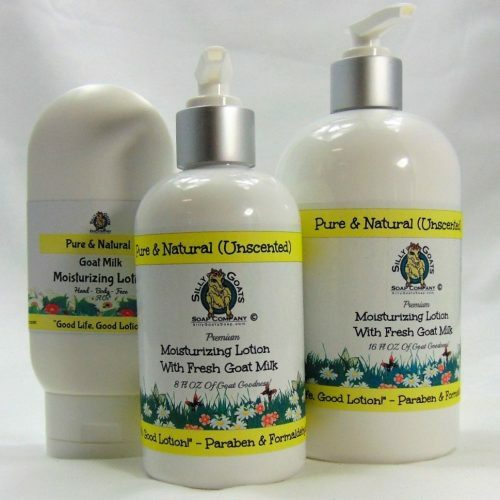 Ingredients: Agua, Olive Oil, Shea Butter, Emulsifying Wax (Vegetable Sourced Natural), Palm Stearic Acid, Sweet Almond Oil, Avocado Oil, Sunflower Oil, Goat Milk, Peppermint & Eucalyptus Essential Oil, Optiphen, Vitamin E.
The Peppermint Eucalyptus Goat Milk Lotion comes in a 4 ounce toggle bottle or a 8 or 16 ounce pump bottle. 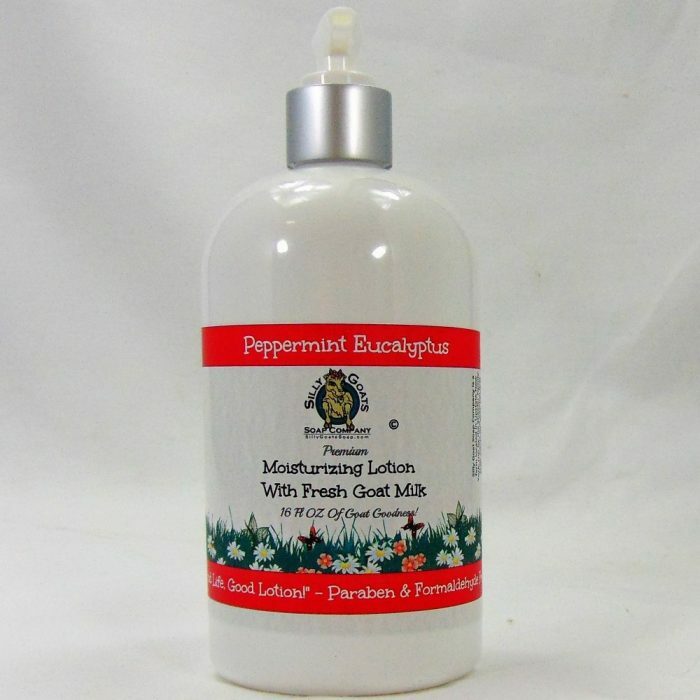 This is my second order of the peppermint/eucalyptus lotion, so obviously I love this product! 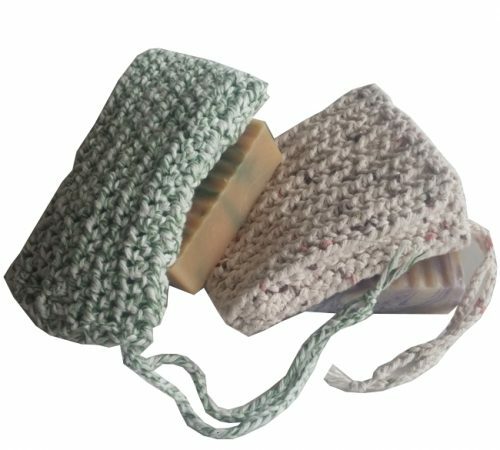 It leaves my skin feeling moisturized, but not sticky, and the scent is both soothing and energizing at the same time. I highly recommend this product! I’ve tried a lot of lotions, and have a strong sensitivity to fragrance. 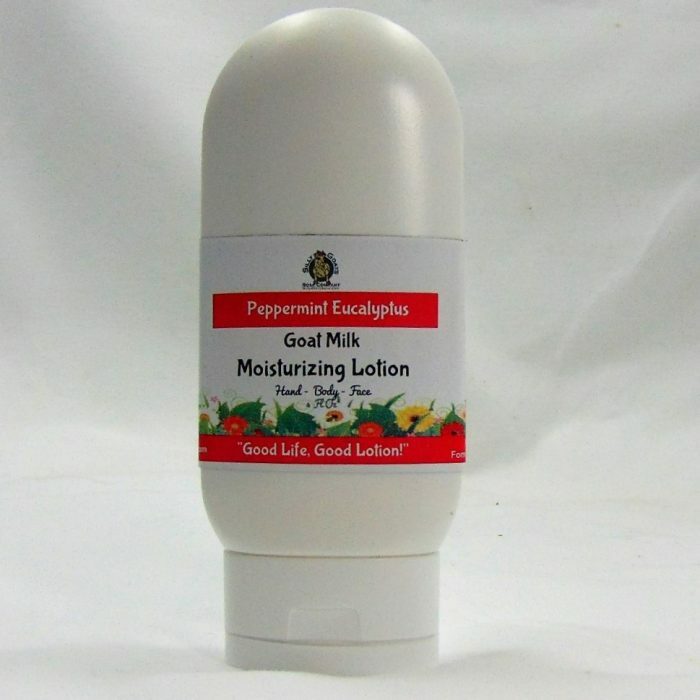 This lotion, with the essential peppermint and eucalyptus oils, really moisturizes my skin and the scent is very soothing. It goes on smoothly and leaves a warm, tingly feeling, as well! 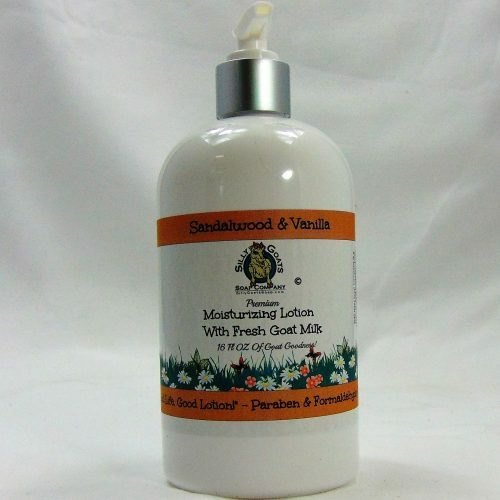 I’ve also used their fragrance free goat milk lotion, and it’s great, too. But since I can’t tolerate most fragrances, it’s wonderful to find a product with a scent that doesn’t bother me. In fact, I love it! If you like peppermint and eucalyptus, I’d highly recommend this lotion! Smells wonderful! Leaves skin feeling so soft. I was so excited to get this order last night! Smells great! Feels great! Love it! Definitely my current favorite lotion OF ALL TIMES! No crazy chemicals, wonderful company, and amazing product. My husbands hands get so dry from working outside during the winter. We’ve tried SO MANY lotions. THIS Brand has beat them all easily!!! We don’t want to use anything else! Wow! Just got this today and am in love! Perfect in every way! Even my hubs likes it… he doesn’t like any scent! This is perfect for Christmas and this super luxuriant lotion will keep our hands in great shape this winter! Love this! Update: this is awesome!!! I have hypothyroidism, so that means dry skin which only gets worse during the winter. It also means deep cracks in my heels. 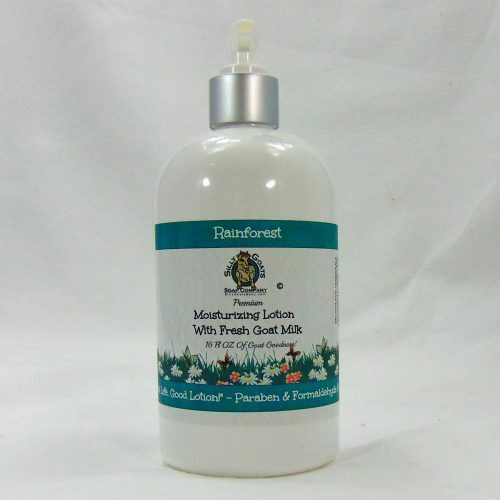 I love how Silly Goat lotion is so natural – no chemical parabens or other questionable chemicals. It is rich and creamy yet absorbs quickly too. 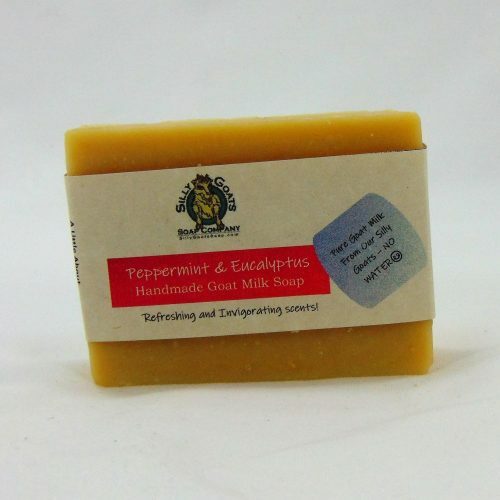 The peppermint essential oil adds a cooling sensation that is great for dry itchy skin that can feel hot. The 8 ounce bottle is a lot – a little bit goes a long way. And it really works for the long run – no need to reapply every 2 hours like some other lotions. I am very happy with my purchase. As long as it is being made I will be purchasing it. 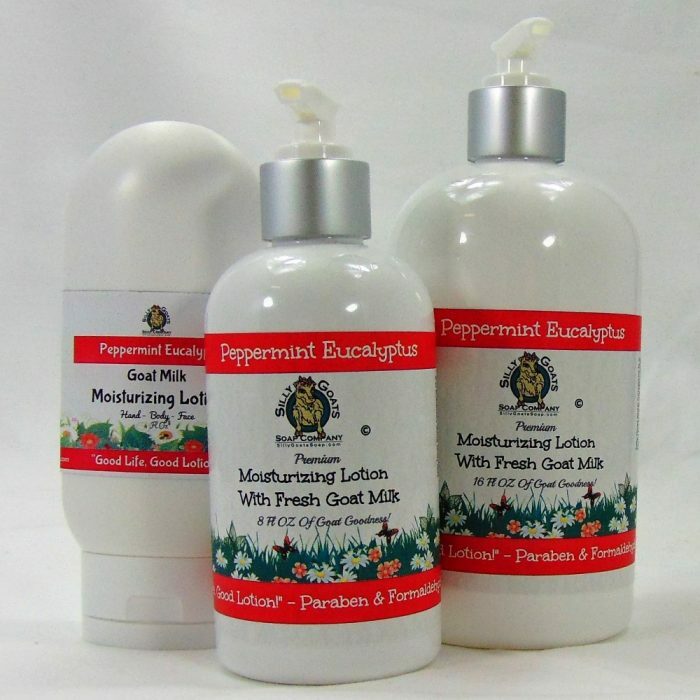 my daughter in law loves this peppermint lotion. I love this product! I work in computers and my hands are consistently tired. I also broke my metatarsal and still have trouble getting my foot back to normal. My husband has been using this lotion for me. He rubs it on other parts that hurt and it definitely does help me feel better. People always complement my smell as well. The two fragrances together make for a combination that lifts my spirits. Both are refreshing and open the sensory system and are also antiviral and antibacterial. And, as with all the other Silly Goats Milk Lotions, it is soothing and moisterizing! A product worth trying! Love the smells and the mentholatum warmth afterwards is wonderful! Silky smooth feeling going on and full of moisturizers!